Lakehead University is naming its new Legacy Society in honour of William G. Tamblyn, the University’s founding President and Vice-Chancellor. The William G. Tamblyn Legacy Society allows Lakehead to recognize its donors and stewards, and recruit and sustain donor commitment. 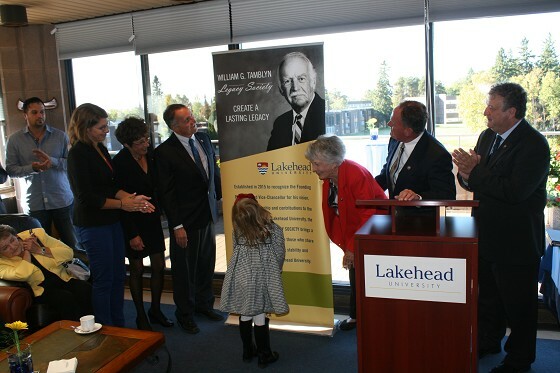 “As Lakehead’s first President, William Tamblyn set the University’s vision and direction through his leadership,” said Dr. Brian Stevenson, Lakehead’s President and Vice-Chancellor. “We value his contribution and dedication to Lakehead University over the years,” Dr. Stevenson said. Dr. Stevenson made the announcement at a reception on Friday, Oct. 2. Tamblyn was also the Chair of Lakehead’s Board of Governors. He received the Queen’s Silver Jubilee Medal in 1978; an honorary degree from Lakehead University in 1981; Lakehead named him a Fellow of the University in 1984; and he was awarded the Order of Ontario in 1993. Lake Tamblyn and the Centennial Building are named in his honor. Society,” said David G. Tamblyn, William’s son. “We can all take pride in what has been accomplished in the last 50 years and the promise of greater things to come. It is my sincere hope the Legacy Society will become an integral part of that future development,” David G. Tamblyn said. The William G. Tamblyn Legacy Society will honour all alumni, staff, faculty and friends of Lakehead who share Dr. Tamblyn’s vision and commitment to the University.